The music of the Final Fantasy series covers a wide range of emotions and scenarios. Each game has a variety of themes to suit epic battles, soulful departures, and boundless exploration. Some of the strongest melodies composed by Nobuo Uematsu are the ethereal tunes that match mysterious settings like the Phantom Forest. As one would expect, the Phantom Forest is filled with all manner of spirits. Many of these spectres are vengeful creatures, bent on attacking the player through random battles. But some of these ghosts are merely waiting for the arrival of the Phantom Train to take them to their eternal resting place. The song mirrors the experience of each otherworldly encounter, using haunting sound samples to create a comforting and delicate melody. For a great cover of this track, along with several other wonderful acoustic renditions of Final Fantasy music, be sure to check out the music of Eiko Ishiwata Nichols. Amount completed: (Chip) Played every song in the Series Mode, currently at 30,000 Rhythmia, already downloaded songs from the DLC Store, generally obsessed. (Laura) Just finished Final Fantasy I through VII, quite done with this for now. Whenever I hear a classic song from a video game, I will have a sort of flashback; a recollection of the happy times spent playing those games. I come down with a chronic case of the warm fuzzies, and my mood brightens as a result. Many longstanding game series rely on this nostalgia effect to interest and hold the attention of veteran game-players. But can a developer hope to make an entire game based around tapping into these happy memories? At first glance, this is exactly what Square-Enix hopes to accomplish with Final Fantasy Theatrhythm. The player is presented with a sampler pack of the best (read: most popular) music from Final Fantasy I through XIII. 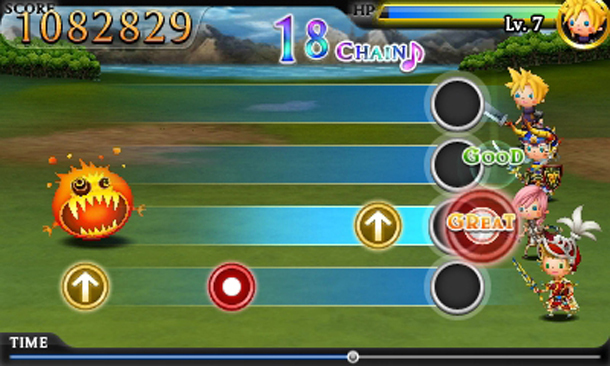 Every title initially features three songs to play, each of a different game type: Field Music, Battle Songs, and Event Pieces. A visual cue from the parent game accompanies each type of song, which serves to enhance the nostalgia effect. 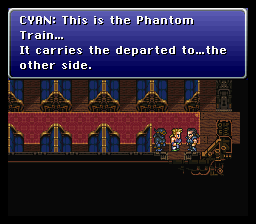 For example, as you cry your eyes out (admit it) to “Celes Theme” from FFVI, classic scenes from the in-game opera will play in the background. Beneath all of the rampant fan-service lies a solid rhythm game rather similar to Elite Beat Agents in gameplay, but with a fun RPG twist. Before playing any of the songs, the player constructs a party of four heroes, composed of characters from across the Final Fantasy universe. As you rhythmically tap away at your 3DS, your heroes level up, unlock new abilities to succeed at higher difficulties, find new items while traveling, and earn Rhythmia points to unlock new characters and songs. That’s right kids, now you can level-grind in a rhythm game, yay! 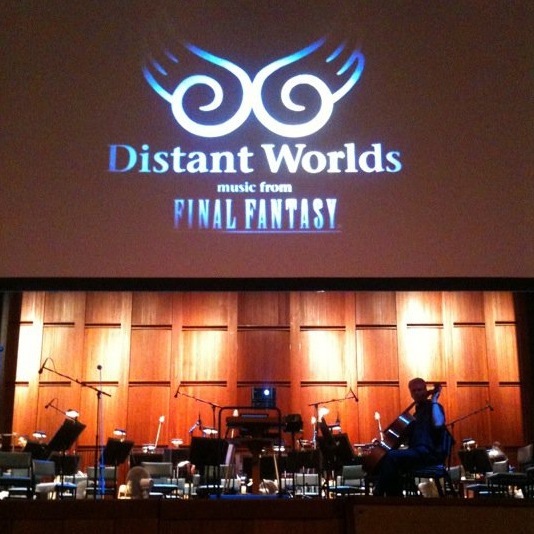 Back in July 2010, Laura and I attended a concert known as Distant Worlds at Wolf Trap in Vienna, VA. The show was performed by the National Symphony Orchestra, and featured most of the music that is included in Theatrhythm. 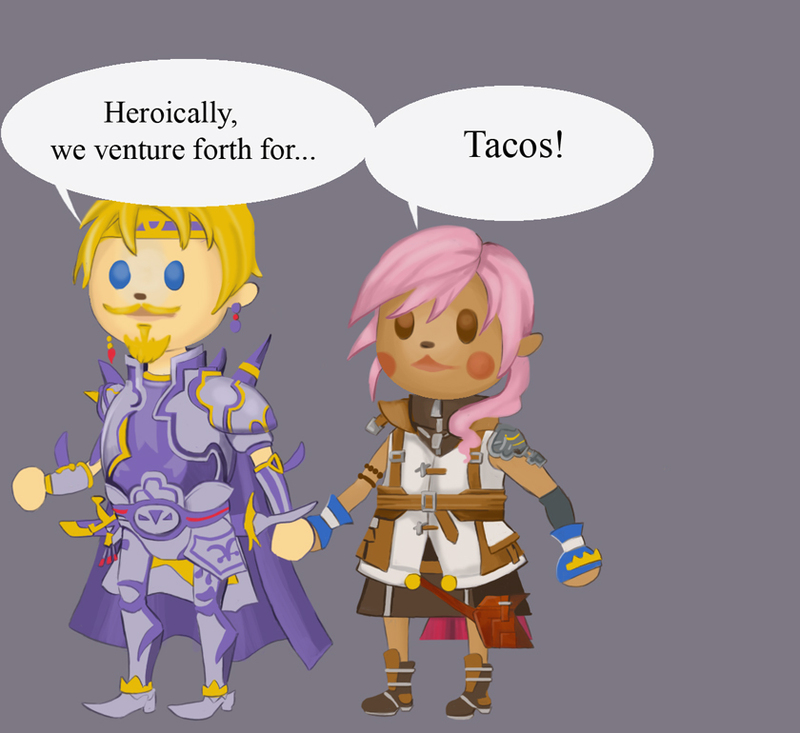 Since I had grown up playing the Final Fantasy series, I was sure to love the show. But Laura had not played any of these games before FFXIII, so I was eager to share this experience with her. Thanks to a set list overflowing with classic tunes, and a stirring vocal performance of the Opera from FFVI, we had a wonderful night, save for the hell of trying to get out of the Wolf Trap parking lot. 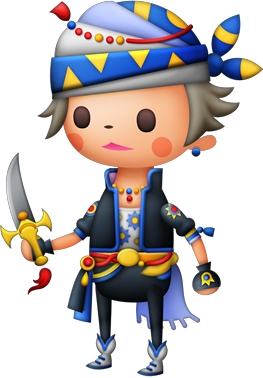 Since that time, I have not had the chance to expose Laura to any more of the Final Fantasy series, so I am eager to hear her thoughts on Theatrhythm. What must it be like to play a game that relies on strong and happy memories when the player has no experience from which to draw? Final Fantasy was not part of my childhood. I didn’t come into the series until Final Fantasy XIII and I’ll be honest, I didn’t even get very far. So it shouldn’t surprise you that I don’t really value the music as much as my friends do. At concerts when Final Fantasy music is covered (and dammit are there a lot of Final Fantasy covers), my friends listen teary-eyed and enraptured by the songs of their youth, while I wait patiently for the artists to play anything else. I’ll be honest, this game (while super-cute) didn’t exactly unearth some long-hidden love for Final Fantasy music that I had simply repressed and buried all these years. If you don’t like the music to begin with, this game won’t change that. The ballads are still the worst, and they aren’t improved by the Event levels. But the battle music and walking songs are nice, and the little sprites are ADORABLE. It is certainly a fun game and I definitely recommend it. The real strength of this game is that each level can serve as an extremely condensed version of the game it represents. So, if you have been dying to share the story of your favorite game in the series, go ahead and foist this game upon your loved ones. Let them play the levels for your beloved games. With a bit of encouragement and a bit of insight and you may stand a chance of getting them to play their longer counterparts. Traditionally, a new year comes with the opportunity for a fresh start; a chance to wipe the slate clean and forget the past. So what better way to begin 2013 than dwelling on the past with our favorite games of 2012? Laura and I made a complete catalog of all the titles we played over the last 365-or-so days, and after careful deliberation (read: throwing darts while blindfolded), we have come up with our respective top three lists. Keep in mind, not all of these games were released in 2012, but all of them were new to us when we started them last year. Some people might have a problem with our inclusion of older games in a “Best of 2012” list, and to them we say, “Well, too bad.” Let’s start the commotion with my picks for last year, shall we? Final Fantasy Theatrhythm: When I first heard the idea of a rhythm game based on my beloved Final Fantasy, I scoffed at the idea. “Look at Square-Enix; after screwing up their flagship series with FFXIII, now they want to twist the RPG classic into a dancing game. The nerve!” Then I considered the possibilities of this game. I already listened to all of the wonderful music from Final Fantasy on a regular basis, and Theatrhythm would allow me to play a game where I could earn points for my obsession. Not only did this fantastic 3DS game allow me to listen to music from the entire Final Fantasy series, but each playthrough included characters, weapons, cutscenes, and inside jokes that flooded my heart with nostalgic joy. Add a robust leveling-up system and fun multiplayer, and I was hooked from the release day. As a bonus, Theatrhythm came out the week of my usual camping trip with friends, so the familiar chords of “One-Winged Angel” and “Searching for Friends” could be heard throughout the wilderness of Upstate New York (along with the manic tapping of 3DS screens). Shadows of the Damned: I will be the first to admit that Suda51’s virtual road trip across the Land of the Dead is not for everyone. The game is rather violent, extremely gory, and full of potty mouth humor and vulgar jokes. But beneath all of the grind-house viscera is a fun title that embraces so many different types of gameplay that it would be hard not to find something to like about Shadows of the Damned. Over the course of the game, players will enjoy third-person action, side scrolling shooting, tower defense, block-turning puzzles, and a bowling minigame to boot! Each of these gametypes are well planned and executed through Garcia Hotspur’s over-the-top journey through Hell to save the woman he loves. Forget playing the next boring installment of other zombie series this year, and stick with this delightful oddball instead; you will not regret it. Halo 4: From the start of 2012, I was staunchly against purchasing the Master Chief’s newest adventure. I had played hours upon hours of Halo: Reach, only to have my friends abandon our favorite series for Call of Duty time and time again. I knew that everyone would just buy Black Ops 2 instead of Halo 4, so I decided to avoid shooters completely and resolved to a year away from Xbox Live. Slowly but surely, all of my friends purchased Halo 4, and in bizzare twist of fate, each of them urged me to come and play the very series they had once left in the dust. So I begrudgingly bought the game and renewed my Gold subscription so I could play some Team Slayer with my comrades. I am now pleased to say that 343 Studios has successfully carried the mantle of Halo to a new generation. The multiplayer modes have been updated to include tactical load-outs that provide more options to each player, while the random spawning of weapons prevents the old trope of, “He who has the sniper rifle and the high ground wins.” The main campaign, while a bit rushed and frustrating at times, does not fail to impress and features some of the most impressive graphics of any game on the market. [Chip] For some time now, I have been told that I am an old soul. I took this as a compliment, until I realized that it simply meant that I do not know what is hip. Fortunately, I have Laura who will scour the Internet and keep me up to date on what is “trending.” This relationship is especially helpful when it comes to expanding my musical library. Laura will play a song or show me a video, we will both geek out about the music, and thus a new favorite is born. So when my better half showed me epic videos of a spritely young woman playing violin covers of video game music, I was sold on a new artist and (sure enough), we went to see Lindsey Stirling in concert. The DC Metro can be a long and harrowing (read: boring) ride from GIMMGP Headquarters into the city. To combat this monotony, Laura and I will often play a portable game of some sort to entertain us. Here are a pair of musical game suggestions for a couple on a train, desperately trying to pass the time. When going to see a concert, a solid choice is Final Fantasy: Theatrhythm. I know what you are thinking, “But Chip, my sig other did not play Final Fantasy growing up, so how could he/she even like this odd game?” First thing to remember is that nostalgia is not necessary to appreciate good music, of which Theatrhythm has a great supply (70 songs!). Additionally, your partner has the opportunity to play a fun and engaging rhythm game with cute characters and storybook art. Besides, picture how adorable this would be: you and your partner, seated side by side on the Metro, each of you sharing headphones with a single earbud, passing your Nintendo 3DS back and forth. You will the envy (and possible nausea) of every passenger on the train. Or you could play Symphonica on your iPad. It is pretty much like Theatrhythm, but with classical music and cute anime boys. Plus, the first three episodes are free, so check it out. While Chip and I don’t always agree with the majority of each other’s musical taste, there are occasional points of intersection on the Venn diagram of our love. 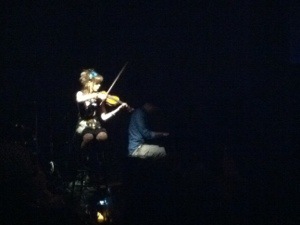 Lindsey Stirling happens to be one. So when she announced her tour dates, Chip and I purchased tickets the first day, mainly because we’re very punctual, not because we expected them to sell out. However, they did sell out. I can’t say how quickly, but it fills my heart to bursting that they did. Close to 400 people from all walks and phases of life came from all over the DC area to see this talented little pixie play her violin. Many of the concerts I have attended in the past have brought me to expect three things from most venues: overpriced greasy food, expensive “cheap” beer, and disgusting bathrooms. The Hamilton defied all expectations by featuring none of these terrible things. 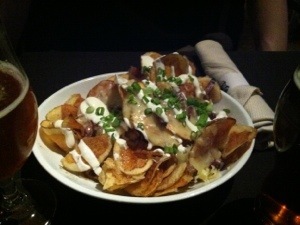 The concert hall is part of a larger (and quite fancy) restaurant, with a diverse menu that won’t break your piggy bank. Laura opted for a healthy option in the form of a spicy tuna roll, while I indulged a personal favorite of mine and ordered a giant plate of potato chips; covered in cheese, green onions, and bacon. Before you judge me harshly, please understand that these were freshly made potato chips, and I have a weakness for homemade starchy snacks (and really, who doesn’t?). The venue was spectacular. Easily the nicest concert hall Chip and I had ever been to. 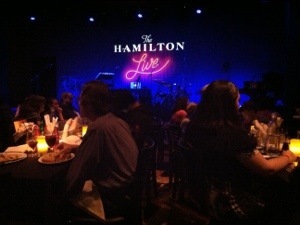 Even Lindsey confided to me before the show that she wasn’t used to playing in such upscale places. 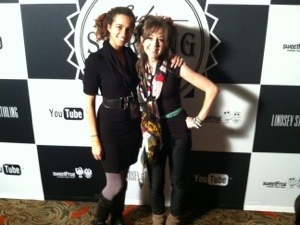 (Please enjoy how I talk about Lindsey Stirling like we know each other even though I simply paid extra money to stand at the end of a very long line to meet her…. She’s fantastic, I would happily be her significantly less talented friend). After seeing Miss Sterling perform, one thing is very clear: Chip and I will certainly chain all of our future children to violins. At least the ones that don’t want to be Olympic gymnasts or mad scientists. But we are not complete monsters. They will of course have some measure of freedom: to choose how Chip and I will live vicariously through them. Goooooood morning to all of our faithful readers! After two solid weeks of vacation and belly dance retreats, Laura and I have returned to GIMMGP Headquarters feeling refreshed and ready to hit the ground running (read: tired, cranky from traveling, and both of us want just one more day before going back to our 9-to-5 jobs). During our little hiatus, Laura has been enjoying the Dawnguard expansion for Skyrim, while I was tapping away at my 3DS to the classic tunes of Final Fantasy: Theatrhythm, so expect some delightful posts on these games in the near future. In the mean time, I wanted to share a limited time offer with our GIMMGP Audience. During the early days of this blog, I shared a t-shirt that my friend Ken had made, which is still making the rounds on various websites and can be found through his Facebook page. 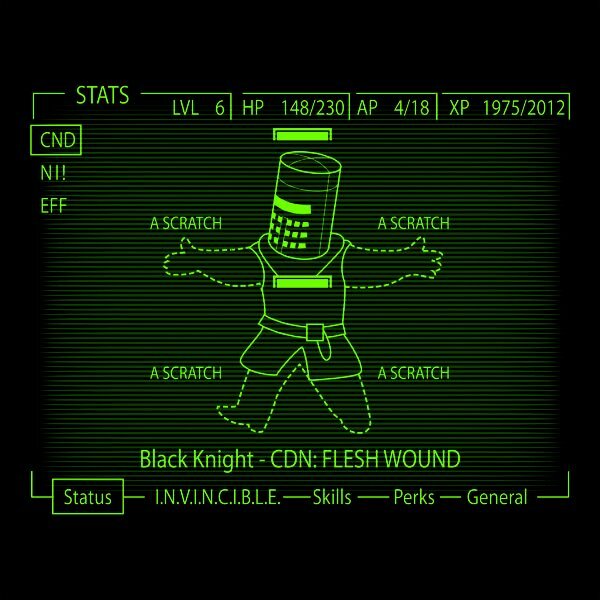 I am very proud to announce that another friend of ours has had a design printed on shirt.woot, which is a fantastic mash-up of Monty Python’s Holy Grail and Fallout 3! While I missed posting the original sale day for the design (no Interwebs in the wilderness, sorry gang), shirt.woot keeps the shirt for sale as long as it stays popular, so be sure to pick one of these excellent pieces while you can! While most folks have been naysaying and hating on the idea of a Final Fantasy rhythm game, I have been interested in this since it was first mentioned. Granted, it has not looked impressive… until now! Hmm, seems similar to Elite Beat Agents, but with a nice twist. Now all they have to do is change the name to something less lame, or easier to pronounce. Allow me to brainstorm! Um, Dance Dance Final Fantasy (DDFF), that’s kinda derivative though. Final Fantasy in Da Club Remixes 2011, no no, too ethnic. Ooh ooh, how about Mog’s Dance Party Mania? No? Alright, then let’s go with the obvious – Final Fantasy: Interactive Soundtrack. A friend of ours has an awesome design for a t-shirt on Qwertee.com. 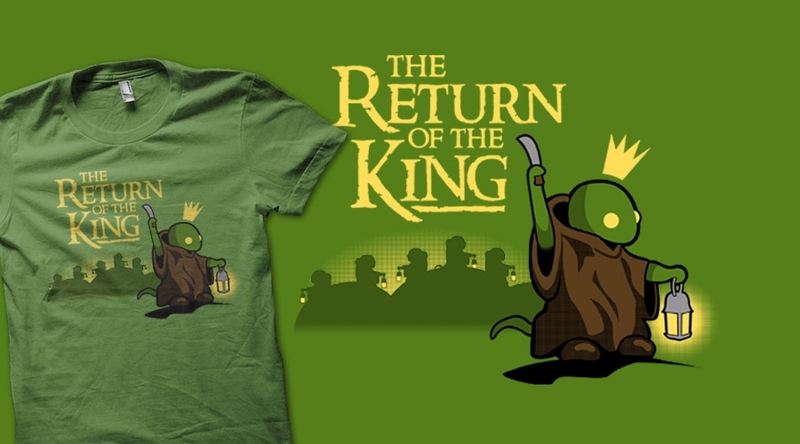 Please to be voting for him, as there is far too little Tonberry-related apparel in the world right now.